China is checking the qualifications of all its commercial pilots, after it emerged that more than 200 of them lied about their experience. The revelation follows an investigation last year by the Civil Aviation Administration of China (CAAC). Half the pilots worked for the parent company of an airline involved in a recent fatal plane crash. 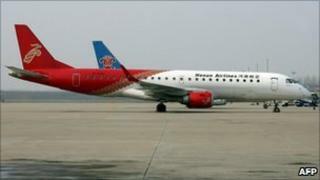 Shenzhen Airlines is the parent company of Henan Airlines, whose aircraft crashed last month killing 42 people. Fifty-four passengers and crew survived the crash, in which the plane missed the runway. Between 2008 and 2009, the employment histories of more than 200 Chinese commercial pilots were found to have been falsified, with some of them embellishing their flying histories. The report said that some of those involved were former military pilots who became civil pilots. After being discovered, pilots were grounded and had to go through re-examinations and re-assessment. A further investigation into qualifications has now been launched by the CAAC, the country's aviation regulator, which says it cannot guarantee it has got rid of all the underqualified pilots. This new investigation will also look at others involved in China's aviation industry, including flight trainers, airline investigators, repair crews and air traffic controllers. Separately, investigators looking into the Henan Airlines crash were focusing on the qualifications of the pilot. China's aviation industry is among the fastest-growing in the world, creating strong demand for experienced aviation professionals. In 2006, it had 11,000 commercial air pilots and hundreds more have been added since then.